Well you definitely got the feel of Myth right there! Extremely ominous and more than a little creepy. 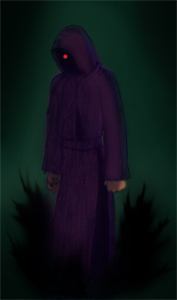 Though, should he have a stole or some embroidery or something to add detail to the cloak/robe? Or should the robe have more shape to it? Just asking because the design seems so different from the other characters in terms of detail. I could see more pointed shoulders and hood for example. Either way, definitely nailed the vibe of the design in my opinion.